"Organic – We are dedicated to promoting foods that are produced sustainably using organic farming methods that are good for the environment." Most of our produce is USDA Certified Organic, which is grown without using most conventional pesticides; fertilizers made with synthetic ingredients or sewage sludge; ionizing radiation, or genetically modified ingredients (GMOs). Our organic dairy products come from animals that are given no antibiotics or growth hormones. Organic foods have been grown in a way that is beneficial to the grower, buyer and the environment. They are healthy, wholesome, flavorful and rich in nutrients. Growing foods organically is an earth-friendly and environmentally sustainable system that improves the health of soils and ecosystems and avoids the use of harmful chemicals. 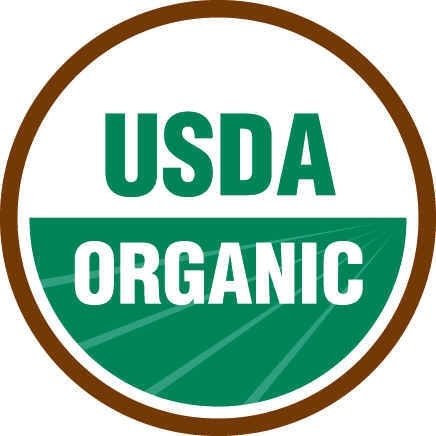 On foods like fruits and vegetables, look for a small sticker of the USDA Organic label or check the signage in our produce section for this seal. The word "organic" and the seal may also appear on packages of cheese, cartons of milk, and other single-ingredient foods. Foods such as beverages, snacks, and other processed foods use the following classification system to indicate their use of organic ingredients. Foods bearing this label are made with 100% organic ingredients (salt and water are not included) and may display the USDA Organic seal. These products contain at least 95–99% organic ingredients (by weight). The remaining ingredients are not available organically but have been approved by the National Organic Program. These products may display the USDA Organic seal. Food packaging that reads “Made With Organic Ingredients” must contain 70–94% organic ingredients. These products will not bear the USDA Organic seal; instead, they may list up to three ingredients on the front of the packaging. Products with less than 70% organic ingredients may only list organic ingredients on the information panel of the packaging. These products will not bear the USDA Organic seal. Please keep in mind that even if a producer is certified organic, the use of the USDA Organic label is voluntary.